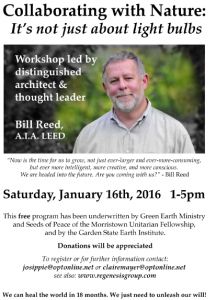 Bill Reed, distinguished architect and global thought leader on regenerative design, will hold a workshop at the Morristown Unitarian Fellowship on Saturday, January 16, 2016 from 1 to 5 p.m. Click here to download PDF flyer. 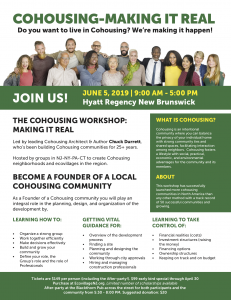 This entry was posted in Cohousing, Ecovillage, Weekend Workshop. Bookmark the permalink.